You probably already know this, but according to the National Association of Realtors, 69% of home sellers found their real estate agent either through one of two ways. They worked with them before. If you’re not generating business from people that you know, people they know, or your past client – you’re missing out on 69% of business! That’s a HUGE number that you can’t afford not to address. Most real estate agents think of referrals as something they are entitled to, however, most of us don’t know how to secure referrals. Just asking someone for a referral is not enough anymore. In order to achieve a referral, you need to be the first thing your clients think of any time they think of real estate. When they have to have a conversation with someone, as soon as it’s about real estate, you need to be the first thing that pops into their mind. And if you haven’t branded yourself enough with your clients – it’s just not going to happen. People forget. Most people live life and we forget, a month later, a quarter later or a year later. It’s not that they forget who you are, you’re just not the first person they think of when they think of real estate. In order to achieve this or make it happen, you need omnipresent marketing. Which is why we practice omnipresent marketing – a new take on working to generate referrals. Omnipresent Marketing is when you have such an influence that you are showing up constantly in the perimeter of your clients live’s. To do this you have to be showing up constantly, which means more than once a year, once a quarter, once a month…in reality, it should be every week. The problem is, we don’t feel comfortable communicating that frequently. 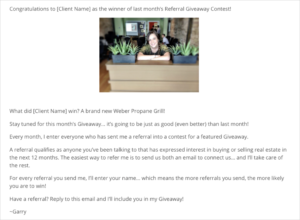 But what if there was a way for us to stay in touch with our clients with high frequency, that feels good to us and them, that produces the effect of being omnipresent in their lives…that’s where the Referral Contest Campaign comes into play. 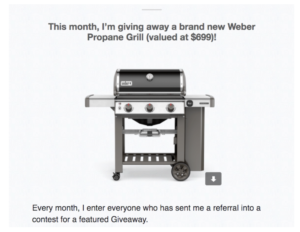 The Referral Contest Campaign is not to try and get someone to give you a referral bc you’re giving something away. The purpose of this referral is to stay in touch with your database. If you can’t afford a $700 grill, think of something worth only $100. If you think $100/month is still too much, think of it this way – you’d be paying significantly more to hire someone to go out and find you referrals! This is business development for yourself and you have to invest a little bit. 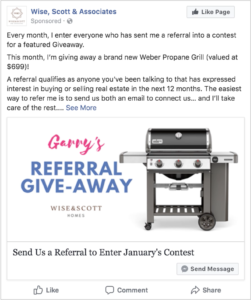 The most successful way to run this campaign is to send about 3 messages a month talking about your Referral Contest as well as create a Facebook Ad to run only to the people that you sent your Referral Contest emails too. Email #3: After the giveaway announce the winner. Again, this campaign is a reminder. It’s an excuse to send 2-3 emails a month and your Facebook Ad without being too pushy, but while practicing omnipresent marketing. Again, last but not certainly not least, DO NOT forget to send out the winner of your contest! It can be incredibly easy to start a contest or “prize” campaign and get discouraged if not enough people participate (especially the first few times you do it), but don’t forget to pick a winner (Even if only one person participated)! This shows your database that you are true to your word and this contest is REAL and is not just a sly way to get referrals. Do not just post the FB campaign and expect to get a result. You have to send out the emails as well, or this campaign will not work. Upload your database of the people who you sent out the Referral Email Campaign to, then run your Facebook Ad ONLY to that database. Again, the key here is to have already sent out the email campaign – the Facebook Ad acts as an additional reminder (and an extra way to practice omnipresent marketing). If you don’t know how to upload your database to Facebook, check out this link! Whenever we discuss the Referral Contest Campaign, questions of legality always come up. And as diligent real estate agents, they should! A referral, as it applies to a real estate transaction, is when one agent refers a client to another agent in return for a share in the eventual commission earned from closing a home while representing that client. 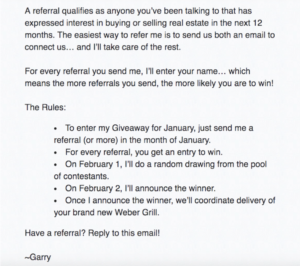 When you’re running the Referral Contest Campaign, you are not asking other real estate agents to refer you a client for a transactional fee – you are simply offering an opportunity for past clients to refer you if they’d like to, in exchange for the opportunity to be entered into a fun contest. The Referral Campaign Contest is legal, however, no matter what, you should always check with your broker and local real estate association if you have any questions. The key to this campaign is consistency. If you can’t do it consistently once a month, start out by doing it once a quarter and then graduate to once a month after you’ve gotten the hang of it. This campaign is fun, the cooler the giveaway the more fun it is. With time, because you’re having a high frequency of communication, what’s going to happen is you’re essentially training your clients to refer you by giving them an incentive and a reminder to do so. The clients who refer you were going to refer you anyway if they had remembered. The key to achieving referrals is to remind your clients who you are on a regular basis (omnipresent marketing) to and stay relevant in their mind.